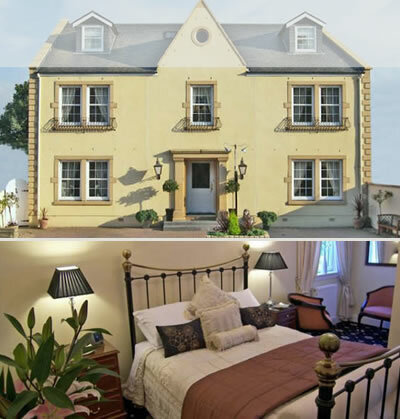 Aaran Lodge is an elegant family run 4 star Georgian Town House with many period details. Our beautifully proportioned double, twin and family rooms are all en suite and tastefully decorated and furnished to the highest standard. Located on the East Side of the city with quick and easy access to the city centre this guest house offers luxury and convenience rarely found. We are 5 minutes by train, 10 minutes by car or 15 minutes by direct bus to the city centre. We are also close to the long sandy Portobello beach and the historic harbour town of Musselburgh this touring and business base has convenience and comfort. We at Aaran Lodge pride ourselves in making our visitors comfortable and content. Adapting to guests needs so far as possible, breakfast can shift early or late, we'll call taxis', advise on transport and routes and direct to good attractions. More a visitor centre than an average guest house, we'll answer any questions or endeavour to resolve any problem that may arise during your stay in Edinburgh. Let's try and make your visit memorable for the right reasons.